Photograph - Digital Image - Partingtons Flat and Whatmough Park taken from hill. Links: 01574.02499 Digital copy of black and white photograph. The Partington and Whatmough families came to Melbourne in the 1840s and moved to Greensborough where they farmed along the Plenty River. 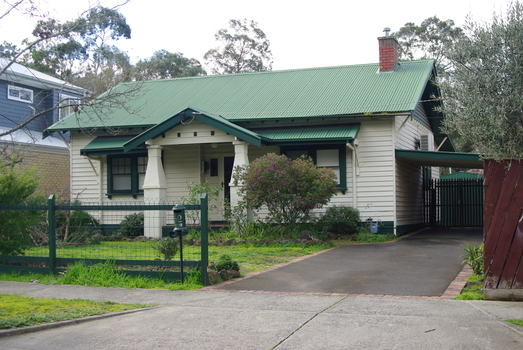 The Partingtons Flat Reserve and Whatmough Park were part of their land holdings and are now Banyule Council owned reserves and sporting fields. Scissorman's Men's Hairdressing moved to 4 Hailes Street East and is now called John's Barber Shop. 20 Plenty River Drive Greensborough. 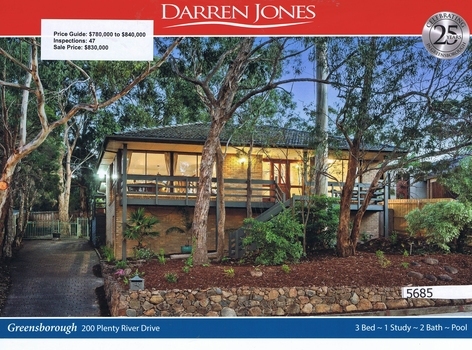 Three bedroom home, sold for $830,000 in December 2017. Previous sales: January 1980, $15,250. 3 pages, torn and yellowed. 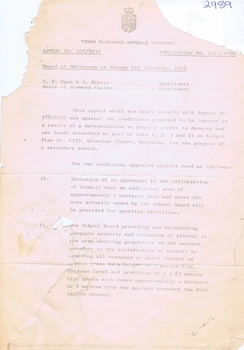 Report on an appeal against two conditions on the development of land in Grimshaw Street Watsonia for a secondary school [Loyola College]. This document demonstrates some of the problems associated with setting up a school in a residential area. Photograph - Digital Image - Greensborough Football Club. Team photograph 1947. Links: 05270:04705 Group photograph of football team, players and support staff. 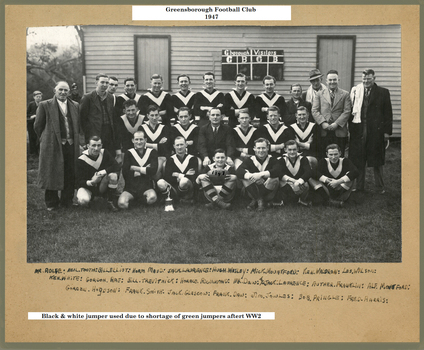 Team photograph, Greensborough Football Club 1947. This photograph was displayed at the GFC Hall of Fame in 2016. Black and white jumpers were in use due to a shortage of green jumpers after World Ward 2. This photograph is a record of the team - players and support staff - involved in the 1900 season. 7 London Court Greensborough. Four bedroom home, sold for $897,000 in August 2017. Previous sales: February 1989, $180,000 and April 1987, $132,000. 1 page, text and colour images. 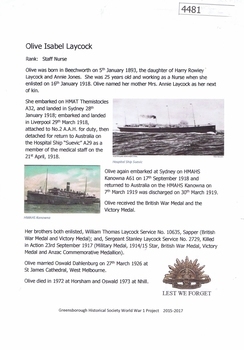 A short article about Nurse Olive Isabel Laycock and her service in World War 1. 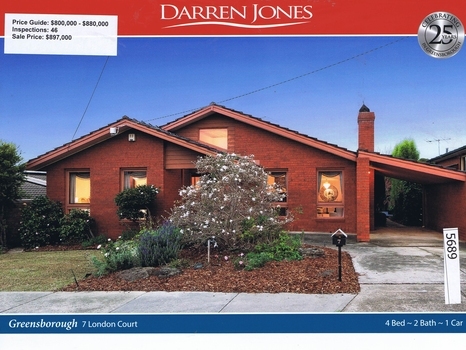 Photograph of 62 Poulter Avenue Greensborough. 2 pages, text and colour images. 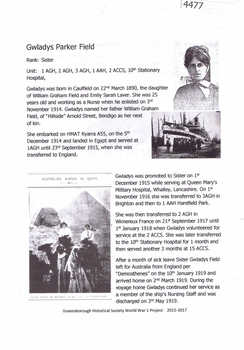 A short article about Sister Gwladys Parker Field and her service in World War 1. In the post-war period ,she was Matron of the Macleod Repatriation Sanatorium. 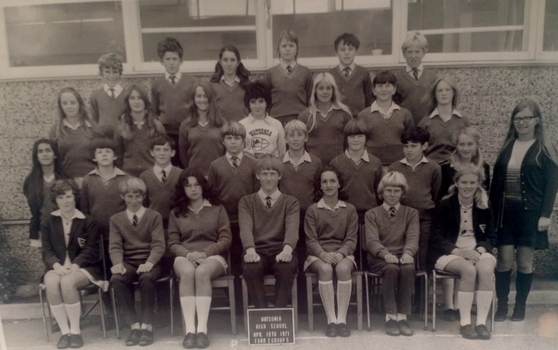 A colour copy of a school photograph. 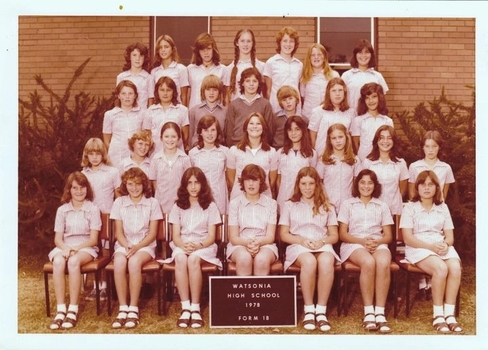 The photograph shows a Watsonia High School class from 1978. 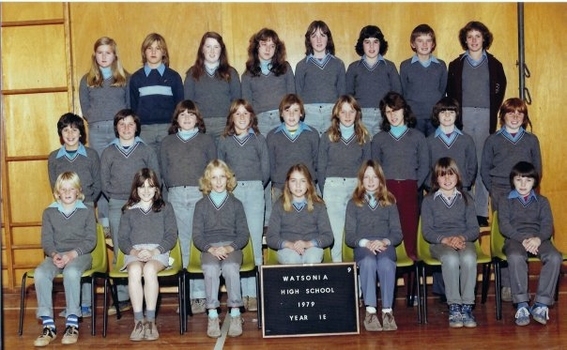 Watsonia High School was a local educational facility that was closed in 1989. 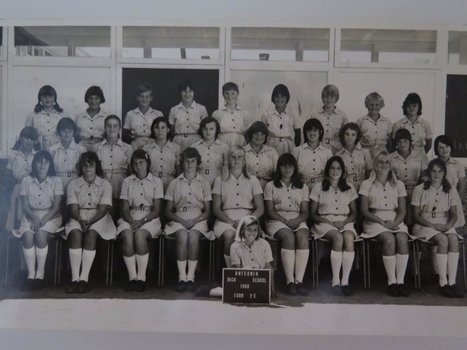 Greensborough Secondary College opened in 1990 which merged Watsonia High and Watsonia Technical School students together. Hall of Fame Citation for Wayne Dobson as he is inducted into the Greensborough Football Club's Hall of Fame as a Member. 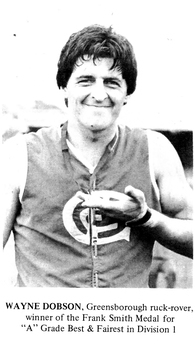 In 2016, the Greensborough Football Club inducted a number of their past players into the Hall of Fame. This Citation outlines the player's contribution to the Club. 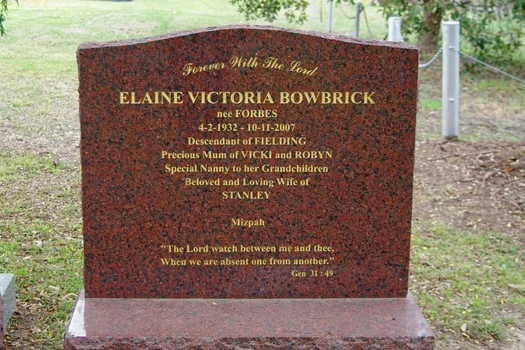 The Grave of Elaine Victoria Bowbrick (died 10/11/2007), St Helena Cemetery. Digital copy of black and white photograph, and closeup.. 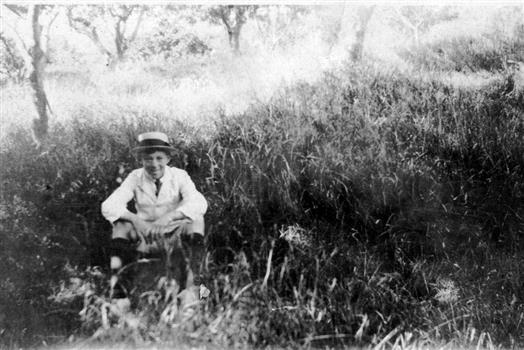 Photograph of Alan Partington as a young man, wearing a boater hat and sitting in grass. 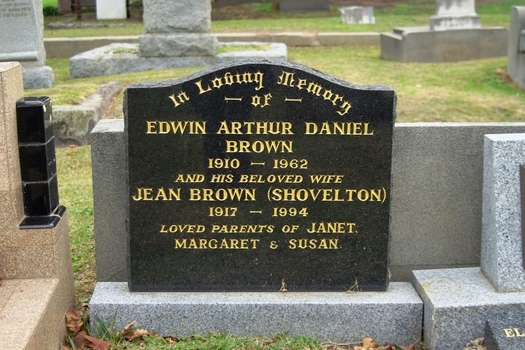 The Grave of Edwin Arthur Daniel Brown (died 12/01/1962) and Jean Shovelton Brown (died 22/04/1994), St Helena Cemetery. 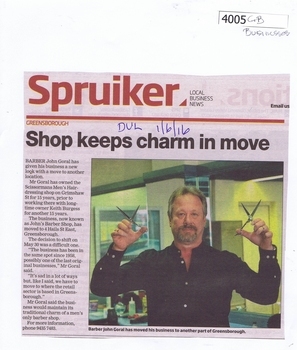 News clipping, black text and colour image. 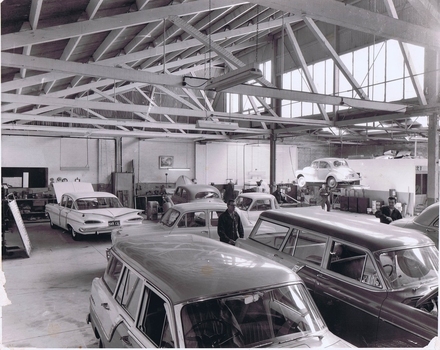 Stubley Garage workshop 1951. The Stubley Group began in 1946 when Purcell Stubley purchased a site with petrol bowsers in Main Street from 'Snowy' Jessop. In 1948 Purcell began building the new Stubley Motors, working round the old site to keep the business operating. It was completed in 1951. The Group expanded into a Holden dealership in the 1960s. Paper ticket, black writing within black border. 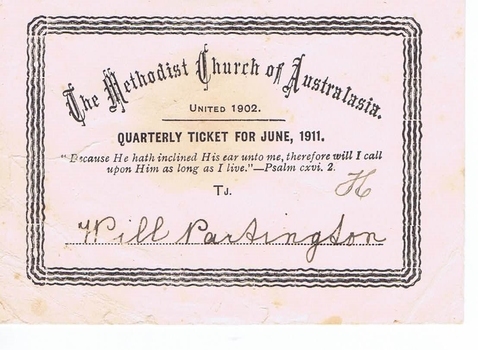 Quarterly ticket issued to members of the congregation of the Methodist Church in Greensborough. This ticket belonged to Mr William Partington and was issued in June 1911. 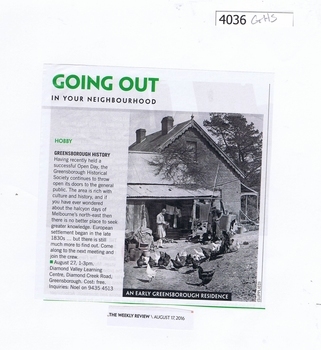 The Partington family are Greensborough pioneers and had long membership of the Methodist Church in Greensborough. In black pen "Will Partington" and the letter "H"
Real estate advertising leaflet, 1 sheet, printed in colour. 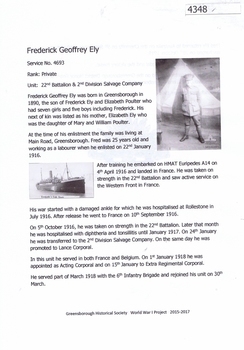 A short article about Lionel Almond and his service in World War 1. 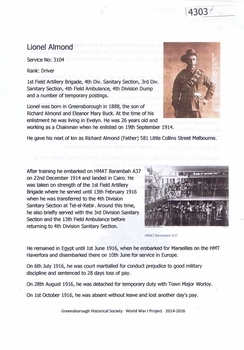 Lionel Almond was born in Greensborough. Digital copy of black and white studio photograph. 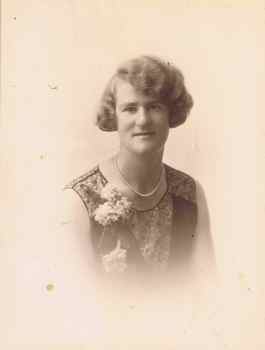 Miss Jean Partington (1903-1992) was Headmistress at Preston Girls’ School. 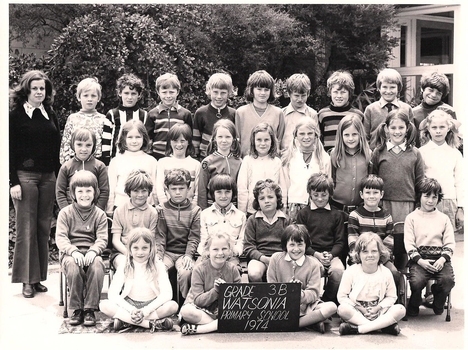 She lived in the family home at 25 Hailes Street until it was demolished for Greensborough Plaza. Her ashes were spread at the old oak tree, next to the railway line, opposite her old home site which in 2017 is the site of the McDonald's franchise in the Greensborough Plaza car park. 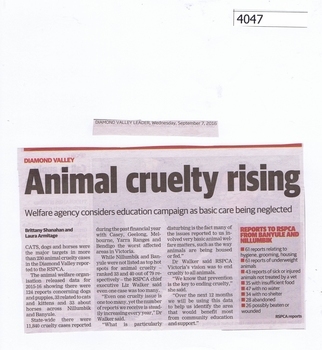 Data released by the RSPCA for 2015-16 shows many cases of animal cruelty reported to the RSPCA. The RSPCA work out of their Greensborough Office at 87 Main Street. A photocopy of a Saturday Age article on a film about the Furphy Brothers. 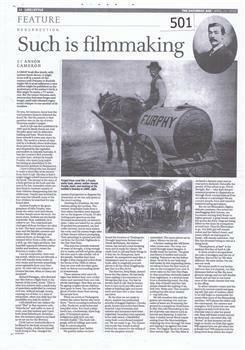 A photocopy of a Saturday Age article on a film about the Furphy Brothers and based on a book written by Joseph Furphy in 1903. This family made the iconic Furphy water carts at their Shepparton foundry. 20-page plastic binder, green cover. 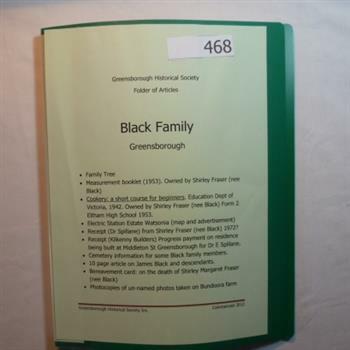 Contains documents relating to the Black family of Greensborough and Watsonia. Contents: Family tree; small school books from family member; copy of map and advertisement for Watsonia Electric Station Estate; receipts; cemetery information; article on James Black and descendants; copies of un-named photos taken on Bundoora farm. 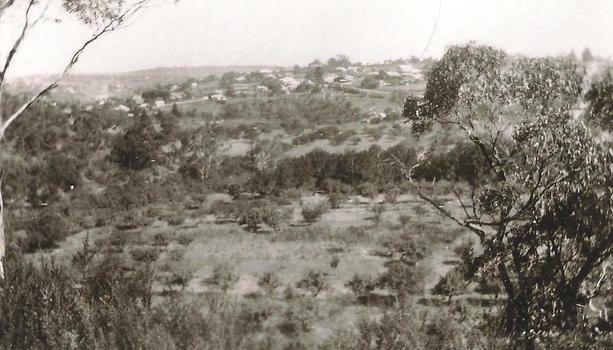 The Black family owned a large portion of land from Greensborough to Watsonia. This collection is partly from family members. It's all about slip-slop-slap in Greensborough for a group Guinness World Record attempt at the most people to apply suncream. 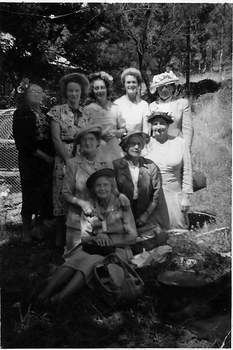 Photograph of unidentified ladies, possibly on a picnic. From the Yandell collection.